Don’t get me wrong, it’s a great pattern and I kind of love Steph C, I just messed it up. Lots of life issues have me tired and irritable and whilst I do really want to sew, I just don’t think new things are working for me right now. I had good intentions to follow along with the sewalong, but like a lot of subjects at school I avoided doing my homework until the last minute. 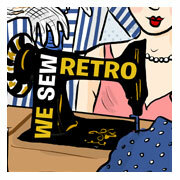 I wanted in but couldn’t find 30 minutes a day to sew, let alone join in discussions. My fabric (a viscose/cotton mix from Tissu fabrics) is really, really stretchy and caused a lot of grief when cutting out, or even just laying on the floor to cut out. 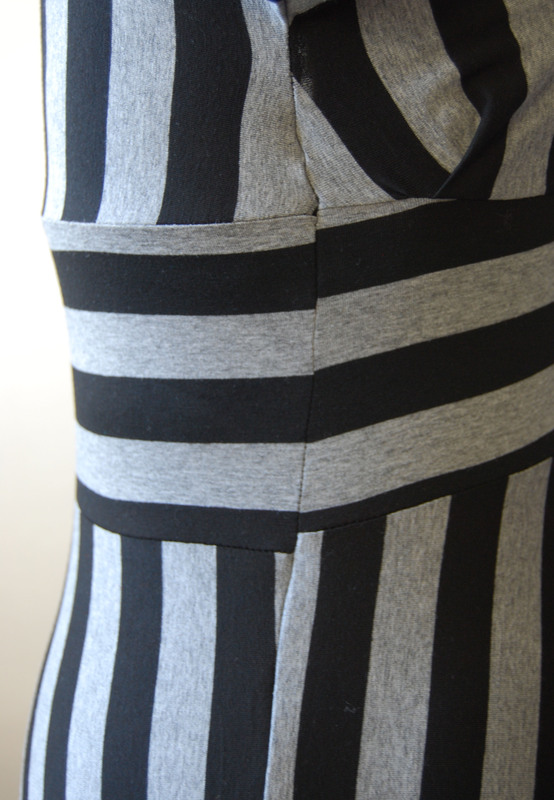 As a result, I had to cut out the front bodice twice because of stripe placement and struggled a lot when stripe matching. My trusty seam ripper didn’t even come to the rescue that much. At the time I needed the camaraderie of the sewalong the most, it had just ended, with everyone sitting around in their finished dresses looking smug (so I envisioned). My own bed had been made and so I lay in it. Alterations I made include lengthening the midriff piece to the larger sizes (works out about an inch), although I did have to cut that off when I screwed up the underbust seam. 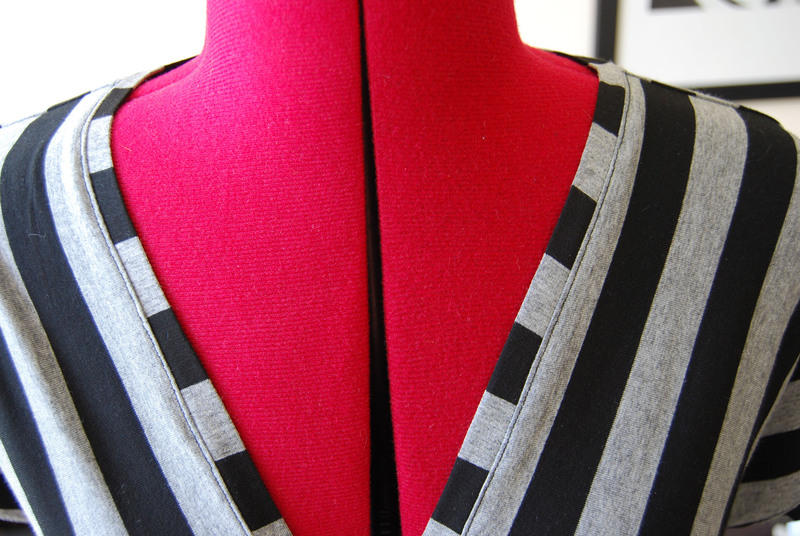 I sewed it with the bust gathers, feeling dubious about gathering this stretchy fabric. It failed. It looked terrible and saggy and weird. Luckily this had been covered in the sewalong and I could just cut it off and start again, this time incorporating a pleat rather than the gathers. However this negated my midriff lengthening and now it sits just above my natural waist. The seam is much better now. You win some you lose some I guess. I also added a bit of length to the skirt. Stripe matching is not my forte it tuns out. I struggled so much with it, and even after a lot of unpicking and re-sewing and basting and unpicking, it’s still not great. It’s no worse than some badly mismatched patterns I’ve seen on rtw clothes though. 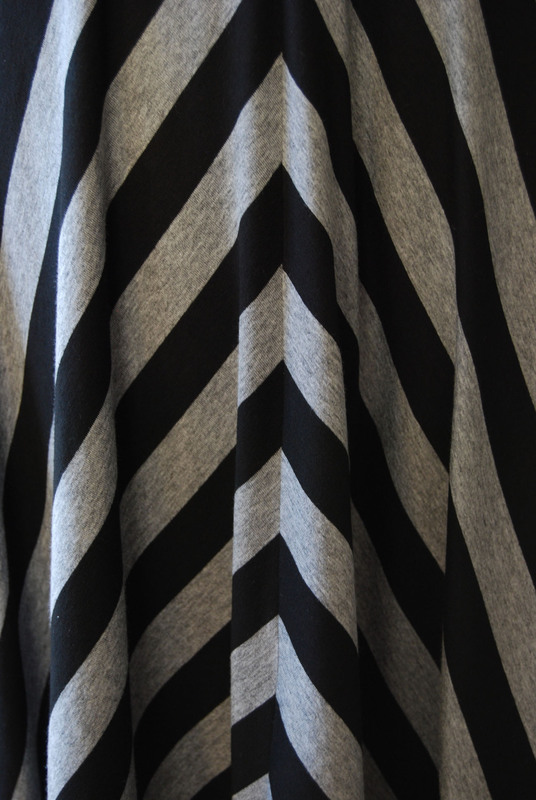 Hindsight tells me that my first stripe matching project shouldn’t have coincided with my first bias knit fabric project. Have a good time I did not. The pockets had to go, sadly. They were made of cotton flannel and felt good to put my hands in. Being a shy, socially awkward person, I find pockets are a great way to stop feeling weird (because you don’t know what to do with your hands). 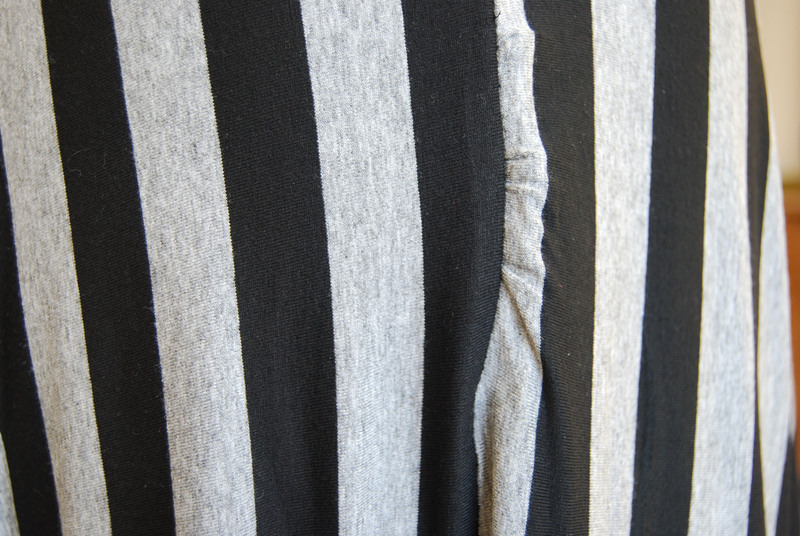 It wasn’t that the pockets added bulk, more that they stuck out at a funny angle, and wouldn’t lie flat. They were angular and stiff from the interfacing so I had to get rid of them. They probably would have been okay in some self fabric. 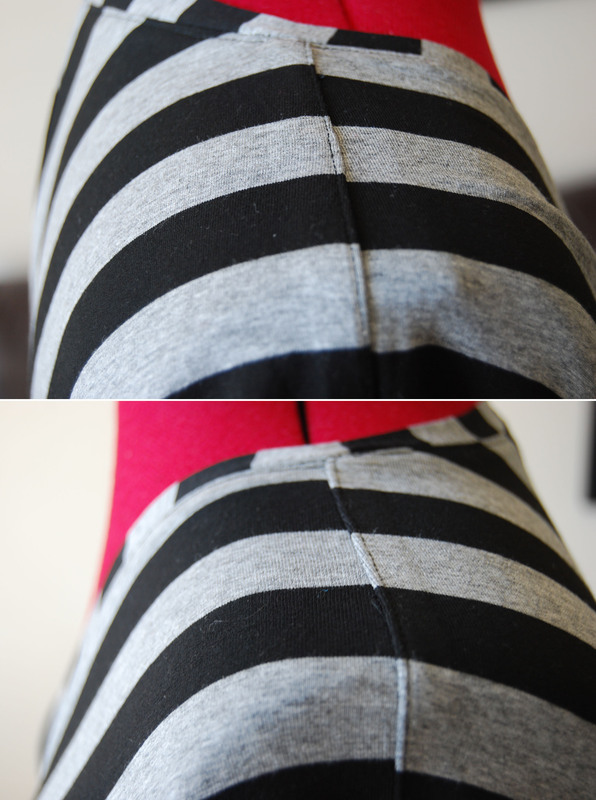 Something strange happened there and now I have a weird side seam. Not impressed. I like this dress, but am sad at the bodge job I had to do to make up for my lack of jersey skills. I should have used something less stretchy, or cut it out on a single layer. Hindsight is a wonderful, yet irritating thing. Having said all that the Tiramisu is a great pattern. As I’ve said I love Steph C a bit too much anyway, and her rational approach to sizing made my heart sing. At last! Someone who realises that humans are different and don’t fit into predetermined sizes, and on top of that the garments allow a range of motion. Her comprehension of the female form in all it’s guises is incredible. I didn’t think that I would like this style of dress, however it’s one of the most flattering dresses I own, bodgy stripes aside. 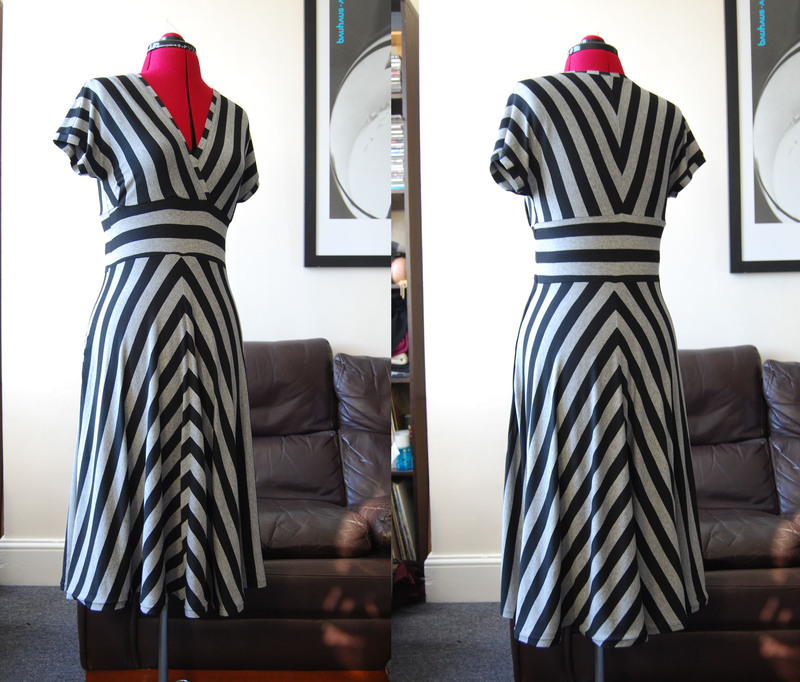 It really is an all encompassing flattering dress, she’s done a great job with her first pattern release. I’m just sorry I cut class so much.